How successful has Alabama been over the past few years? So successful that some fans are upset that the Tide "only" beat Ole Miss by 19 points, 33-14. Although the Tide defense gave up 14 points on two long drives, the defense intercepted the Rebels three times and held them to under 250 total yards of offense. The Crimson Tide offense, meanwhile, struggled at times Saturday night against the Ole Miss defense. AJ McCarron threw 2 touchdown passes and continue his consecutive streak of not throwing an interception breaking Brodie Croyle's old record. 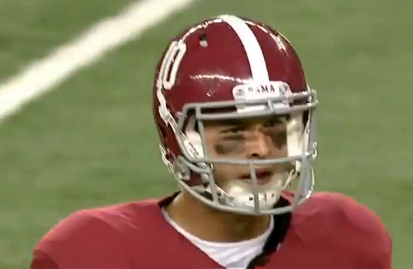 But despite breaking the record, McCarron thought the offenses' performance was "mediocore". The break-out performance of freshman wide receiver Amari Cooper, had a lot of fans thinking of a certain Atlanta Falcons wide receiver; Julio Jones. Cooper had 2 touchdown receptions along with 85 yards receiving. The biggest news of the night was the injury to wide receive DeAndrew White who left the field with what looks like a knee injury. The Tide has the weekend off before getting back into league play at Missouri.